Below you can view all the townhomes for sale in the Wynterfield subdivision located in Durham North Carolina. Listings in Wynterfield are updated daily from data we receive from the Raleigh multiple listing service. To learn more about any of these townhomes or to receive custom notifications when a new property is listed for sale in Wynterfield, give us a call at 919-759-5468. 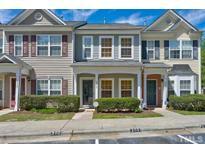 Convenient to RTP, shopping, highways, NCCU, Duke, UNC, and Southpoint Mall. MLS#2249922. 5026. Shopping centers are within a minutes drive. MLS#2248884. 5222. Access to two assigned parking spaces. Tenant occupied lease ends 7/31/2019. MLS#2248837. 35. 1st floor BONUS room currently being used for additional bedroom. Upgrades throughout. MLS#2246460. 475. Split bedroom design offers privacy w loft, 2nd bedroom & full bath MLS#2245398. 283. Enjoy exploring Durham with ease, enjoying convenience to RTP, Duke, DPAC, and more! MLS#2245367. 2784. This home is part of the Wynterfield HOA. MLS#2238894. 4823.